Gary is a city in Lake County, Indiana. It is perhaps best known as the birthplace of the legendary pop star Michael Jackson. Founded in 1906 as a company town for U.S. Steel, it thrived in the 1950s and early 60s and earned the nickname "The Magic City". 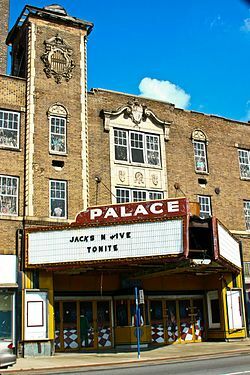 In 2007, it was described by writer Jessica Hopper as "the Pompeii of the Midwest, a city of ruins where life can seem to have just suddenly stopped". Gary is both famous and infamous. It's the "just one place that can light my face" and "home sweet home" effusively described in the song of the same name from the 1957 musical The Music Man. It's the childhood home of Michael, Tito, Jermaine, and the rest of the Jackson family. It's also home to an unattractive and often industrial-smelling stretch of highway east of Chicago, and has repeatedly ranked first in the nation among large cities for homicides per capita. When designing the city, the U.S. Steel Corporation bragged that its engineers "took for their guidance the motto that hangs in the office of the big company's chief executive, "It can be done," and made Gary at least an attractive, if not a beautiful, residential town," and posited Gary as evidence that "management has always shown its realization of the fact that "not by bread alone does man live"; that the mere paying of employees a living wage is not sufficient, and that even the least educated worker has an aesthetic sense, even though often uncultivated, that should be developed and pandered to within reasonable limits if the best good of the worker and the employer is to be achieved." As U.S. Steel began to struggle in the late 1960s, the city's economy followed, and it has yet to recover. Two casinos, legalized in Gary out of sheer desperation, make it a destination for gamblers on short trips and locals on pay-day. Its crumbling architectural heritage also makes it a favorite—and dangerous—destination for urban exploration. 41.616389-87.4127781 Gary/Chicago International Airport (GYY IATA) (at the northwest corner of the city, and is accessed from I-90 at Gary Rd/SR-912 at Exit #10). There's no regular commercial air service, but there are occasional charter flights. The nearest airport for regular commercial flights to Gary is Chicago Midway International Airport (MDW IATA), 30 mi (48 km) northwest of Gary via I-90 and W 59th St (Exit #58A). Southwest Airlines is the largest carrier here. Midway is more compact, less crowded, has fewer delays, and usually cheaper and closer than Chicago O'Hare International Airport(ORD IATA) which is 46 mi (74 km) away. The Chicago/South Shore Line has two stops in Gary, with departures at least every two hours. 41.605573-87.3945392 Gary/Chicago Airport and 41.604363-87.3389193 Adam Benjamin JR Metro Center, the latter one is near downtown. Tickets vary depending on how far you are traveling. The nearest Amtrak stations are 10 miles (16 km) away in Dyer and Hammond. Take the Indiana Toll Road from Illinois ($3 from Chicago) or Ohio to exit 14A (Gary West) or exit 17 (Gary East). Exit 17 intersects with Interstate 65 and U.S. Routes 12 & 20. Lake Michigan and the Grand Calumet River are nearby. There is a limited local bus service. The depot is two blocks west of the baseball stadium, and it's quite easy to walk around the four-five blocks of downtown Gary (including the City Methodist Church ruins). However, while visiting Gary, use of a car is strongly advised, both due to limited transport, and relatively high levels of violent crime (even downtown, at night). Gary was a thriving city in the 1950s and early 60s, and it has the architecture to prove it — intact or otherwise. The Ingwald Moe House (669 Van Buren) and The Wilbur Wynant House (600 Fillmore) were designed by master architect Frank Lloyd Wright in 1910 and 1916, respectively. The Wynant House is in rough shape, with several years of start-and-stop restoration work and changes in ownership. For more Prairie-school action, head to Marquette Park for the Marquette Park Pavilion (tours M-F 9AM-5PM) and the Gary/Chanute Aquatorium (+1 219 938-8081), designed by George Maher in 1922 as the Gary Beach & Bathing House. An aquatorium is a place where one can view — not swim in — water, so don't show up in your bathing suit. There's a major display dedicated to the Tuskegee Airmen. The old Gary Post Office (Sixth and Massachusetts) is missing a few things, most notably the US Postal Service and a roof, but it's still there; built in 1936, the interior is now off-limits, but fans of tree-in-building shots who can't make it all the way to Angkor can catch a glimpse of several saplings behind the teller windows. The Gary Memorial Auditorium (Seventh and Massachusetts) and the City Methodist Church (Sixth and Washington) are former city landmarks, in ruins after the Great Gary Arson of 1997. The latter is something of an Urbex mecca, and well worth a visit if you're willing to brave it. Don't let the barbed wire fence fool you, there are two wide open entrances on Washington, no "no trespassing" signs, and, happily, a parking lot opposite the building! The stairs are well-tested and safe enough, although the upper levels are not interesting compared to the amazing theater & main room on the first. Be sure to look for the last of the church's grand fireplaces in between the theater and main church — it's the last, as the rest have been stolen by enterprising, and quite undoubtedly strong, thieves. The Gary Mural Project redecorates boarded-up storefronts along Broadway. The Gary Children's Museum (273 Cleveland St; +1 219 882-7061) is in town. Jackson family home 2300 Jackson St.
Gary SouthShore RailCats, U.S. SteelYard Stadium, ☎ +1 219 882-2255. Home games are played between mid-May and early September. Northern league (minor league) baseball team. $10 per ticket, parking free. Marquette Park is a beloved outdoors area, and is really quite beautiful (especially Marquette Aquatorium listed above). The beach is by far the nicest west of the Indiana Dunes National Park's West Beach, and is a fine place for a dip during the day. A stroll through around the lagoon and its pretty bridges west of the Aquatorium is also a nice way to kill some time. There are two casinos along the lakeshore, both of which have plenty of fake-Vegas glitz and few traces of the city outside. One of the two casinos had once been a Trump Casino, and Trump brought the Miss USA pageant here, but now they are operated by the Majestic Star, and as before, they are reached from the same parking lot and entrance platform. 41.64-87.421 Majestic Star Casino and Hotel, 1 Buffington Harbor Drive, ☎ +1 219 977-7932, fax: +1 219 977-7811. Indiana University Northwest has a campus in Gary, with about 5,000 students. Ivy Tech Community College is also in the area. The city is not widely renowned as a shopping destination, and with good reason. There's little to buy here that you couldn't buy elsewhere, and most (budget) shops are in strip malls outside the city center. Gary is, however, perhaps ground zero for Michael Jackson and Jackson Five memorabilia. An easy (and, it must be said, cheesy) spot to pick up the goods is the small indoor marketplace at 487 Broadway, which also boasts a good collection of over the top celebratory Obama tees. The Market City Flea Market (4121 Cleveland St., +1 219 887-3522) is open F-Su 9AM-5PM. Gary is extremely short on sit-down eateries. Take out is much easier to find if you have a car—look in and around the run down strip malls along 5th Ave outside of the city center. Lake St, on the way from the city proper to Marquette Park, has about two blocks that look incongruously charming, and there you'll have no trouble getting a slice of pizza. 41.596482-87.2674381 Arman's Dog House, 5875 Melton, ☎ +1 219 939-1000. M-Sa 10AM-10PM. Also known as Dawg Fish Grill, has plenty of meat and no qualms about frying it up for you. Italian Sandwich Shop, 487 Broadway, ☎ +1 219 880-2636. M-Sa until 5PM. The appetizing soul food cafe at this location has been replaced by a less interesting sandwich shop. It is, however, an easy place to stop in when downtown—it's less than a block from City Hall, friendly, and welcoming. And there is at least one local sandwich—try the "U.S. Steel." Juice Garden, 2700 Fifth, ☎ +1 219 881-0212. M-Sa 8AM-6PM, with breakfast until 11AM. A grocery store and health-food restaurant that serves organic grub because they believe God wants it that way. It's run by a local minister and his family. It's vegan-friendly (but not exclusively). 41.60058-87.2672772 Miller Bakery Cafe, 555 S Lake, ☎ +1 219 427-1446. Lunch Tu-F, dinner Tu-Su. This is as upscale as dining gets in Gary, with contemporary American, Asian, French and Italian dishes, a nice location, and a sizable wine list. Call to confirm hours and for reservations. There are bars and lounges all over Gary. The trouble is, they're all shuttered, having closed or burned down in years gone by. Chops Lounge, 3100 W 5th Ave, ☎ +1 219 949-1810. Notable for being open, and it may offer live musical performances. The Palace on 5th, 529 E 5th Ave, ☎ +1 219 886-9346. Music usually starts after 9:30PM. The place to go for live music in downtown Gary. Music is near and dear to Gary locals, and their blues and jazz acts are of a quality very rare in small cities. (And, as you might imagine, Gary is a natural incubator for the blues.) Since there are so few real venues for musicians, the caliber of local performances here can be really high. Other acts include the occasional (Chicago-style) steppers dance night, as well as regular R&B karaoke on Wednesdays. You'll probably want to day-trip from Chicago, which is about 45 minutes away; Hammond (about 20 minutes) has some reasonably non-decrepit discount options. Majestic Star Casino, 1 Buffington Harbor Dr (in the eponymous Casino listed above). This is not a good hotel—seedy lodgings in a seedy casino. But it's the nicest in Gary, and it's not so bad that you must avoid it if at the casino, or on a business trip. $90-150. As mentioned above, Gary has repeatedly ranked first in the United States for murder rates per capita, so take care. Due to the economic depression, many businesses close in the evening, so call ahead to confirm that wherever you're going is still open, and don't set out at night without a destination in mind. If you're tempted to do some urban exploration, bear in mind that the poverty of the city means that much more potential danger from people squatting in abandoned properties. Make sure someone knows where you're going, and check in with them as you go. Methodist Hospital Northlake Campus, 600 Grant St, ☎ +1 219 886-4000. The Indiana Dunes are a short drive away. This city travel guide to Gary is a usable article. It has information on how to get there and on restaurants and hotels. An adventurous person could use this article, but please feel free to improve it by editing the page. This travel guide page was last edited at 09:51, on 7 April 2019 by Wikivoyage user Mbrickn. Based on work by Wikivoyage users Mx. Granger, Traveler100bot, Traveler100, Ground Zero, SelfieCity, JakeOregon and Anyone150, Wikivoyage anonymous users 97.113.32.23 and 38.69.6.131 and others.